With David Haig nominated for a Laurence Olivier award for his awe-inspiring performance in The Madness of King George III, I wafted up the celebrity and paparazzi-studded red carpet at Wyndham’s Theatre on Tuesday to review The King’s Speech – the latest offering in what’s turning out to be an aptly Royal-themed year. The audience included Dame Eileen Atkins, Brenda Blethyn and Kenneth Clarke MP. Since British-born David Seidler, at the ripe old age of 73, won the 2011 Academy Award and BAFTA for Best Original Screenplay for The King’s Speech, theatre executives were champing at the bit to explore producing his stage play of the same name. The film took over £250 million at the box office globally so it was a safe bet that a theatre production of the same name would attract not only huge press attention but large crowds ready to compare and contrast. Seidler, having personally experienced what it means to live with a stutter, commenced writing the play in the 1970s, but was forced to set it aside when, having asked the Queen Mother for permission, she requested he defer the project until after her death. It wasn’t until Seidler was diagnosed with cancer in 2005 that he decided to return to it and rewrite it as a film script. Having waited over 25 years to get The King’s Speech noticed, it’s understandable that Seidler is making the most of it. This production, directed by former RSC chief Adrian Noble, was the first time the play had been performed on stage and had its world premiere at the Yvonne Arnaud theatre in Guildford last month. 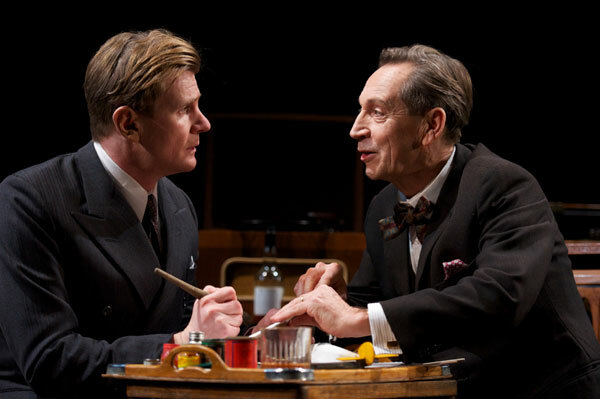 The play chronicles the unique relationship between ‘Bertie’ the Duke of York and outspoken Australian speech therapist Lionel Logue, and how their frank relationship ultimately succeeds in overcoming Bertie’s debilitating stammer. The action takes place during an unsettling period for The Royal Family when Bertie’s brother, the impetuous Edward VIII, succeeds George V and plunges the government and The Firm into a constitutional crisis by insisting on marrying American divorcee Wallis Simpson. With the possibility of Edward VIII abdicating and thrusting Bertie, unprepared, into the role of King looming – Lionel, in his Harley Street practice, vigorously coaches Bertie to sing, swear and yell his way through the fear of public speaking. “Do you know the f-word?” Lionel asks Bertie. “F-f-fornication?” When, on the verge of World War II, Edward VIII renounces his throne to marry Wallis, it is impossible not to empathise with Bertie’s predicament at finding himself a substitute King with a speech to deliver to the nation live on radio, and preparations for the coronation in full swing. As much as I would like to hail this as a perfect production, I can’t. Charles Edward, relatively unknown to the general public, is utterly convincing as Bertie, as is Jonathan Hyde as Lionel Logue, a remarkable feat considering they are following such memorable performances by Colin Firth and Geoffrey Rush. I also particularly liked Michael Feast’s extremely humorous interpretation of the obnoxious Archbishop of Canterbury, Cosmo Lang. On the other hand, I loathed Ian McNeice’s bespectacled and grotesque portrayal of Winston Churchill, bizarrely reprised from a recent Doctor Who episode, and was indifferent to the dainty Emma Fielding in the role of Elizabeth, the late Queen Mother, who failed to fully convey her steely but kindly personality, hence limiting most of the chemistry to Charles Edward and Jonathan Hyde. Joss Ackland was warmly received by the audience, making his return to the West End to play King George V after an absence of 13 years, and leaving us all to hope he will be gracing us with his presence more often. Fans of the film will be in for a treat, as there is very little to distinguish the unravelling of the story from the medium of screen or stage – it should be simply seen as an enjoyable extension and the combined achievement of Seidler’s brilliant work. 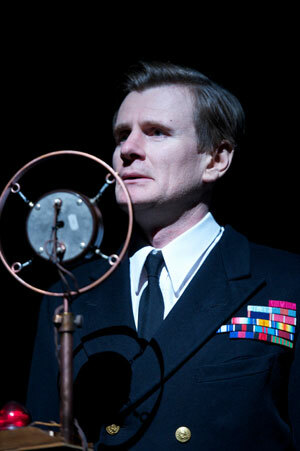 Succeeding in delivering most of the comic and sentimental elements you’d expect (helped along by Elgar’s Nimrod), the play is well paced and looks visually impressive thanks to Anthony Ward’s clever revolving set, Nikki Woollaston’s deft choreography and Mark Henderson’s atmospheric lighting. Booking until 21/07/2012 at Wyndham’s Theatre, 32-36 Charing Cross Road, London WC2H 0DA. Tickets: £17.50-£52.50. 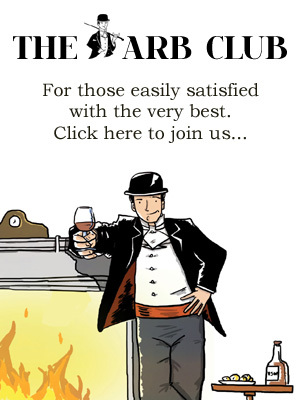 Telephone: 0844 482 5120 (24 hours) or visit the website.